"North woods" redirects here. For other uses, see North woods (disambiguation). A dirt road in the North Woods forest. 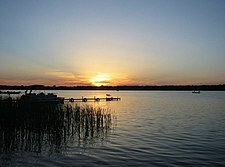 Sunset on a northern Minnesota lake. 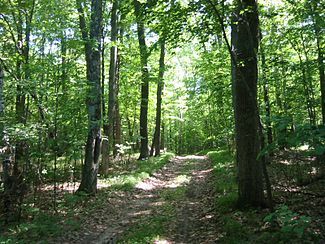 The Laurentian Mixed Forest Province, also known as the North Woods, is a forested ecoregion in the United States and Canada. Among others, this terminology has been adopted by the Minnesota Department of Natural Resources. Similar, though not necessarily entirely identical regions, are identified by the United States Environmental Protection Agency as Northern Lakes and Forests, and by the World Wildlife Fund by regions such as the Western Great Lakes forests and Eastern forest-boreal transition. In the United States, it consists of a broad region of northern Minnesota, Wisconsin and Michigan (Northern Michigan and the Upper Peninsula) and the forested areas of New England. In Canada, it is found in Ontario around the Great Lakes and the Saint Lawrence River through Quebec to Quebec City. Nearly all of the region was covered by glaciers during the last Ice age, which created many lakes and wetlands throughout the region. The poor soils and cool climate in this region were not conducive to farming for early settlers, which resulted in the regrowth of most of the forest after being cleared during the 19th and early 20th centuries. With the abundant lakes and streams and regrowth of the forests, the region became a major tourist and recreation area for the larger population centers just to the south. 1990 USDA Hardiness zone map detail for the northeast US. Zone 3a is light orange, zone 4b is light lavender. The area is a Temperate broadleaf and mixed forests biome transition zone between the true boreal forest to the north and the Big Woods and Carolinian forest to the south, with characteristics of each. It has areas of both broadleaf and conifer forest cover, and bodies of water ranging from lakes to conifer bogs and swamps. Conifers include pines, spruces, firs, and junipers; deciduous types include aspens, oaks, paper birches, mountain ash and maples. It is often said to have a distinct smell, which is attributed partially to the presence of sweet fern. The climate for the region roughly corresponds with USDA Plant Hardiness Zones 3a through 4b, although in New England the region extends into zone 5a. The forest region is adapted to the Humid continental climate with warm, humid summers and cold, snowy winters. The Köppen climate classification is Dfb. During the lumbering era, unrestricted logging and the resulting fires destroyed much of the forest. With the advent of fire suppression and forest management, the resulting second-growth forest differed substantially from the original forest cover. Conifer tree species became less common in the resulting forest. Early successional tree species such as Aspen and Birch became much more prevalent and replaced much of the mixed conifer and deciduous forests that originally existed prior to the logging era. Major animal species inhabiting the forest include White-tailed deer, Moose, Porcupine, Beaver, the American red squirrel, the Eastern gray squirrel, Chipmunk, Opossum, Raccoon, Bobcat, Canada lynx, Fisher (animal), American marten, Long-tailed weasel, Ruffed grouse, Spruce grouse, Bald eagle, Red-tailed hawk, Osprey, Common loon, Duck, Canada goose, Wild turkey, Sandhill crane, Snowshoe hare, the American black bear, Coyote, Red fox, and (in the Canadian and upper Great Lakes states regions) the Gray wolf. Elk have been reintroduced in northern Wisconsin, Michigan, and Ontario after having been extirpated prior to the 20th century by overhunting and habitat loss. Lone Cougar have been documented moving through the region, but these appear to consist of solitary young males dispersing from the Great plains, and little evidence of breeding populations is currently known to exist in the region. The Boreal woodland caribou used to inhabit the American portions of the region, but with the destruction of the original forest during the late 19th and early 20th centuries and the resulting expansion of the White-tailed deer population (which carry the deadly Parelaphostrongylus tenuis brain worm parasite), the species is now confined to Canada. Woods Lake and background mixed forest in Wisconsin's Governor Thompson State Park. Early French, British, and American trappers exploited the large populations of furbearers in the region, especially the American Beaver. As a result, populations of these furbearers plummeted, only recovering after the institution of modern game management. During the 19th century, Native Americans in the United States were forcibly removed from their lands and/or confined to small reservations after signing treaties with the U.S. government. As a result of these treaties, most of the land in this region was opened to white settlement. However, many of the treaties guaranteed off-reservation hunting, fishing, and gathering rights on the ceded lands. After several court cases during the 20th century in which these rights were upheld, Native Americans continue to exercise their hunting and gathering rights. The initial economy of the region was heavily dependent on logging. The logging progressed from east to west across the region during the 19th and early 20th centuries as the supply of virgin timber was exhausted. The logging provided the lumber necessary to build cities and towns throughout the eastern and central U.S., and communities sprang up around the saw mills that were built to process the lumber. The massive scale of the logging greatly reduced the prevalence of the large Eastern White Pines (Pinus strobus) and Red Pines (Pinus resinosa) formerly found throughout the region. Major wildfires feeding on the logging slash during the late 19th century resulted from the unrestricted and unregulated lumbering throughout the region. The Peshtigo Fire on October 8, 1871 in northeastern Wisconsin was the deadliest wildfire in American history, with more than 1,500 deaths resulting from the fire. After loggers left in late 19th century, lodges were built as fishing camps and affluent sportsmen arrived by rail. In the 1920s, roads were built and automobiles became more affordable. The next four decades were the golden age of lake resorts of the North Woods. The influx of families continued towards the north, and the now familiar log-cabin look with massive beams, fieldstone fireplace, and boulder foundations became synonymous with the North Woods. In the late 1940s and 1950s, the expansion continued. However, today, only a few classic-styled lodges survive to give a feel of the golden era. In addition to the many private resorts in the region, many of the cutover forest lands were acquired by state and federal governments for forestry purposes after early attempts at farming the region mostly failed. The resulting national, state, and county parks and forests throughout the region provide sustainable logging and recreational opportunities. ^ "Laurentian Mixed Forest Province". Ecological Classification System. Minnesota Department of Natural Resources. 2007. Retrieved 2007-09-21. ^ Gibbon, Guy E.; Johnson, Craig M.; Hobbes, Elizabeth (2002). "Minnesota's Environment and Native American Culture History". A Predictive Model of Precontact Archaeological Site Location for the State of Minnesota. Minnesota Department of Transportation. Retrieved December 18, 2017. ^ Heinselman, Miron (1996), The Boundary Waters Wilderness ecosystem, Minneapolis: University of Minnesota Press, pp. 16–31, ISBN 0-8166-2804-1 . This page was last edited on 13 March 2019, at 17:56 (UTC).